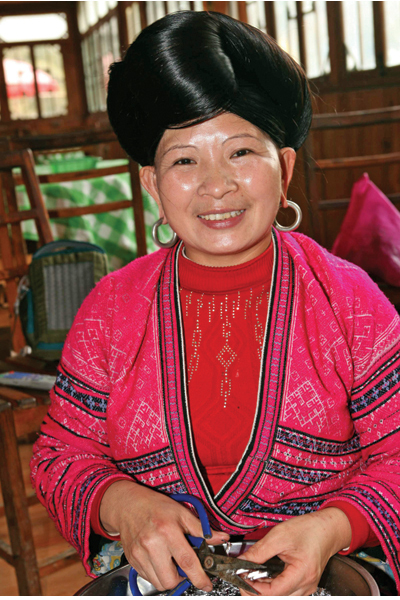 The Hongyao have kept the tradition of women wearing their hair long, and it seems to have paid off. Fans of Rapunzel may be amazed to find out that she is not only real, but there's more than one of her and they're all Chinese. 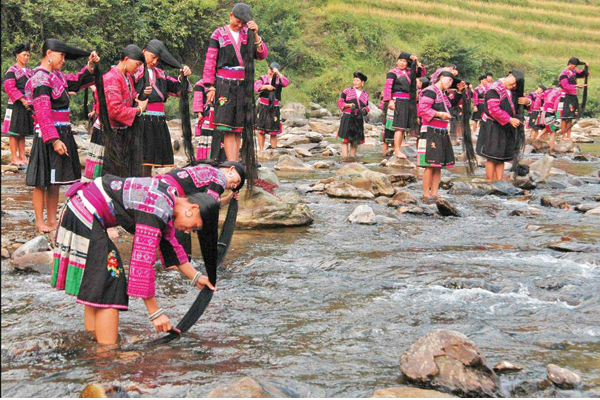 In Huangluo Hongyao village, deep in the mountains of Longsheng county in the Guangxi Zhuang autonomous region, women are famous for their ancestral tradition of wearing their hair long. Hongyao refers to ethnic Yao people who wear red (hong) clothes. There are 82 households, comprising more than 400 villagers, and they share the same surname, Pan. About 80 out of the 120 women have hair that is more than 1.4 meters long. The longest is nearly 2.1 meters. "Long hair means longevity, wealth and good fortune for Hongyao women. The longer one's hair is, the more fortunate one will be," says Pan Hongmei, 46, a restaurant owner whose hair coils around her head, with a big bun above her forehead. "When she combs her hair once, her hair will become dark and shiny. She makes up her face and dresses gaudily for her lover. When she combs her hair twice, her hair becomes thick and shiny. She and her husband will love each other forever," Pan sings, quoting the lyrics from the traditional Long Hair Song. When a Hongyao girl reaches 18, she usually has an ear-length haircut, keeps the cut hair and adds it when she coils her hair later. This is the only time Hongyao women are allowed to cut their hair. They also collect hair that falls out and add it to their hair when they give birth. Before marriage, they wear a headscarf because, traditionally, only the bridegrooms can see their hair. Married women don't wear scarves and have a different coiled hairstyle after having a child. They usually put a wooden or silver comb on the top of their hair, so that they can comb whenever they want. "It takes us two or three minutes to coil our hair without any hairpins. We use hair to tie up our hair, turning it around our heads two or three times to make a bun. When I had to change my hairstyle after giving birth, I spent several days at home learning the new hairstyle," Pan says. "I wash my 1.5-meter-long hair every three days and rarely use a hair dryer because it dries out. The secret to keep one's hair dark and clean is to wash with the water used to clean rice. It's a natural shampoo and hair conditioner." Like other female villagers, she stores the water in a pot and boils it before washing her hair so the water ferments. She then rinses her hair with spring waters "which is cool in summer and warm in winter." Then she wrings it and puts it up on her head to dry. 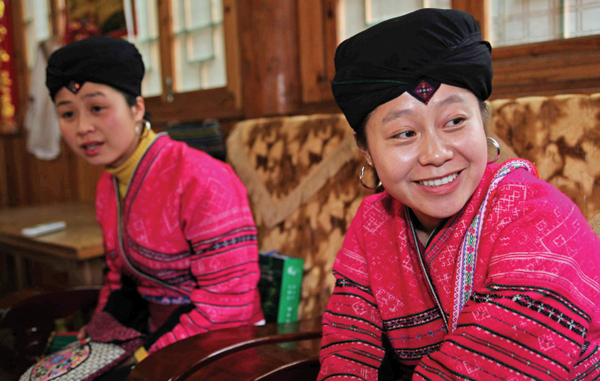 "My long hair is always noticed when I go outside the village," 27-year-old Pan Yongyan says. "It's inconvenient when I take the train or bus, because it's uncomfortable to sit for a long time with the big bun and inconvenient to comb my hair when I wake up on a sleeper berth." She works in the village's singing and dancing performance group and displays her long hair for tourists, earning about 2,000 yuan ($318) a month in the peak season of tourism and 1,000 yuan in the off-season. She performs six or seven 40-minute shows per day at most. In January 2009, she went to Beijing to become an assistant to actress Huang Shengyi for four months. There, she used shampoo to wash her hair. She had to get up early or go to bed late to wash and dry it. "I felt like a stranger in the city and was lonely. The pace of life there was too fast," she says. She says she prefers to be at home because she can be with her family and the money she earned in Beijing is about the same as she earns in her village. "When I was a kid, I was depressed about my long hair because my classmates would discuss it all the time. But I started to cherish it gradually," she says. Besides performing, she also waitresses in her family's restaurant, does housework and makes embroidery. "It takes three years to embroider a Yao-style outfit. It's for my dowry, and my mother helps do the needlework," Pan Yongyan says. "The tourism boom has changed our lives greatly. We used to sing a folk song saying that Huangluo was the poorest village, but now we are living a pretty good life." They live in diaojiaolou, houses typical of several Chinese ethnic groups, including the Dong and Miao. They keep cattle and pigs on the first floor, live on the second floor and store goods on the third floor. Pan Hongmei says these days, however, for hygiene reasons, domestic animals are kept in another building. "Some people build brick buildings, but I prefer wooden diaojiaolou because I want my offspring to inherit our traditions. My 4-month-old granddaughter will wear her hair long, too." Huang Feifei contributed to the story.